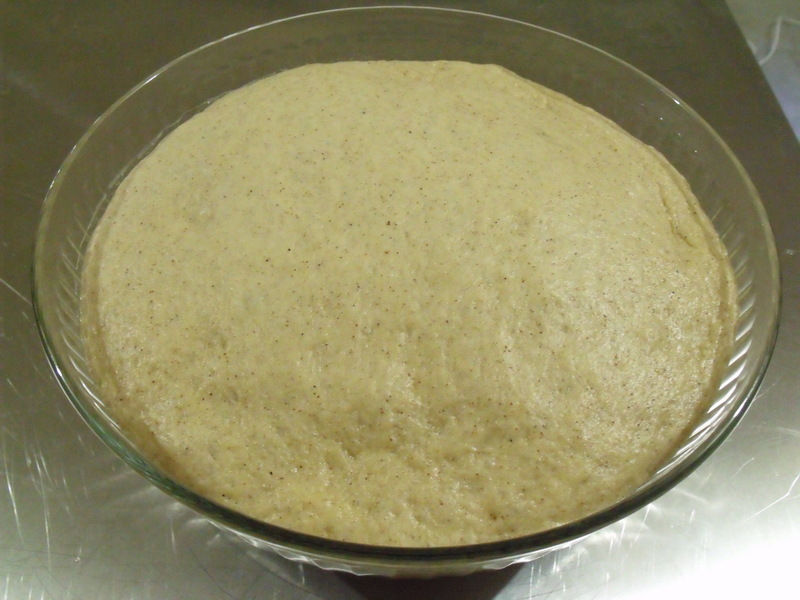 Place the yeast, 1 teaspoon of the sugar & warm water into a bowl & mix together until sugar has dissolved, set aside until foamy, about 10 mins. In a large bowl put the flour, remaining sugar, cinnamon, ginger, cardamom, salt & nutmeg & just give it a mix with your hand. Add the chopped butter to the flour mixture & rub it in until mixture is crumbly. Make a well in the centre then add the yeast mixture & stir it in, it will be dry, now add the extra water a little at a time, mixing it in as you go until you get a soft dough, ( if it feels a little sticky don’t add more flour because when you knead it on your floured surface it will pick up the extra flour from there). 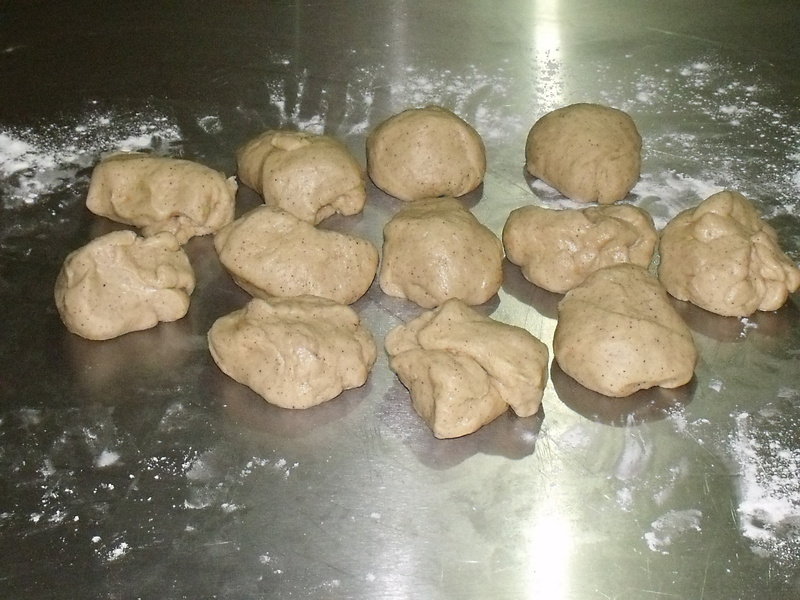 Turn dough out onto a lightly floured surface & knead for about about 5 mins or until the dough is smooth. 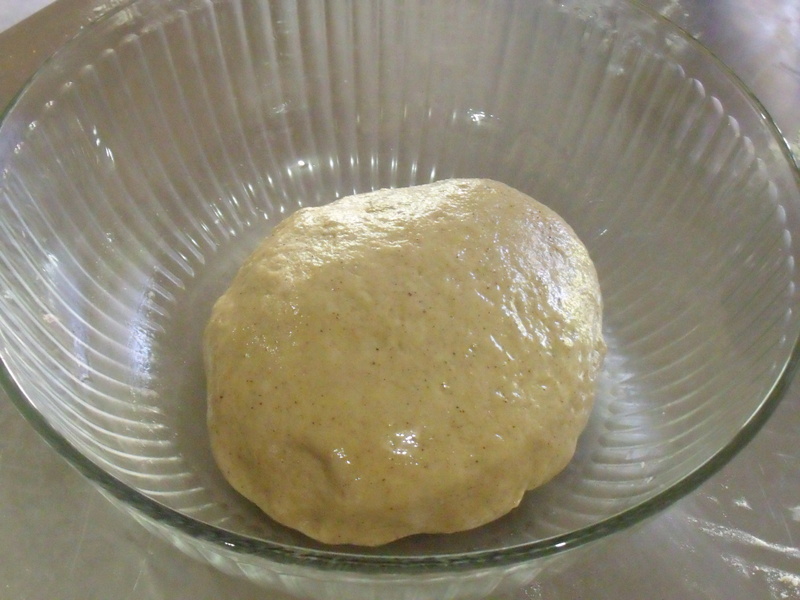 Place it into an oiled bowl & leave to rise until doubled in size, mine took 1 ½ hours. 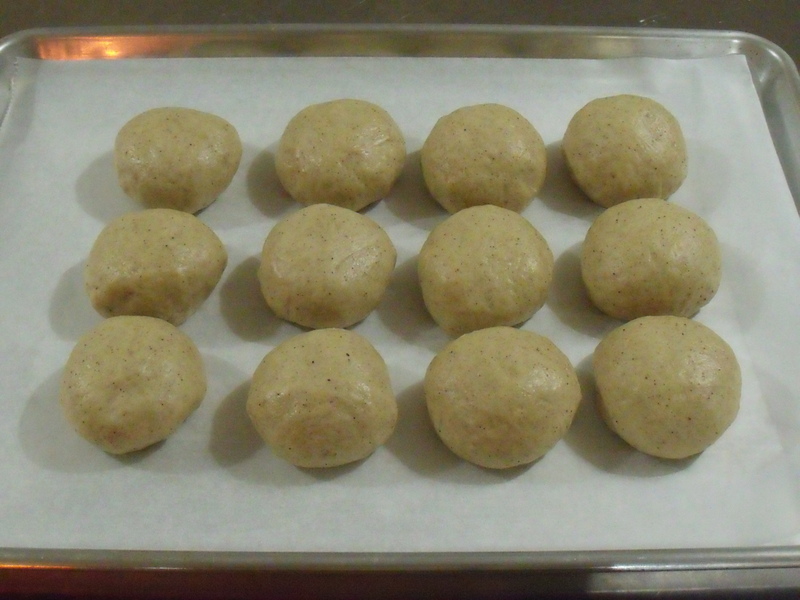 Dump the dough out onto your floured surface & knead again just for a minute or so, cut into 12 evenish pieces & roll each piece into a round, place them on a lined baking sheet, cover with plastic wrap & leave to rise again for 30 mins. 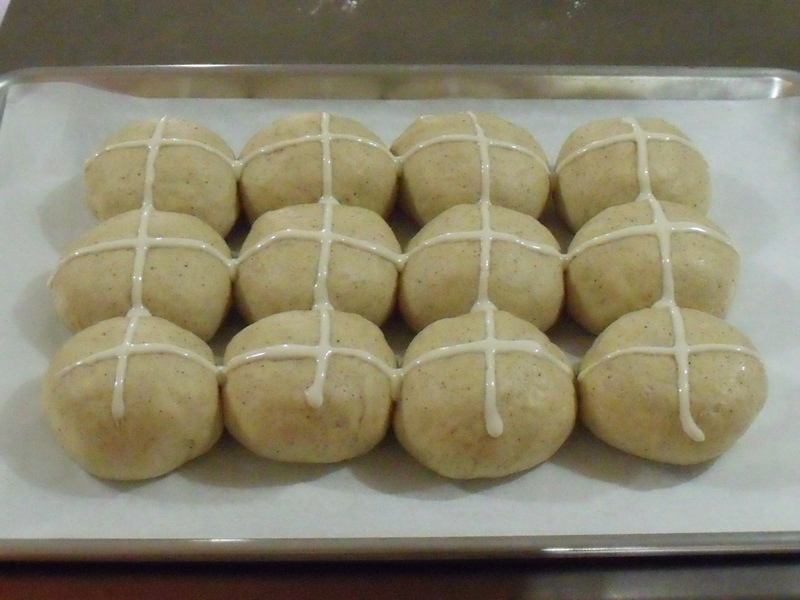 Make the paste for the crosses by placing the flour, sugar & water into a bowl & mixing until you get a smooth paste. When adding the water do it 1 tablespoon at a time mixing it after each addition until you get a double cream type consistency. 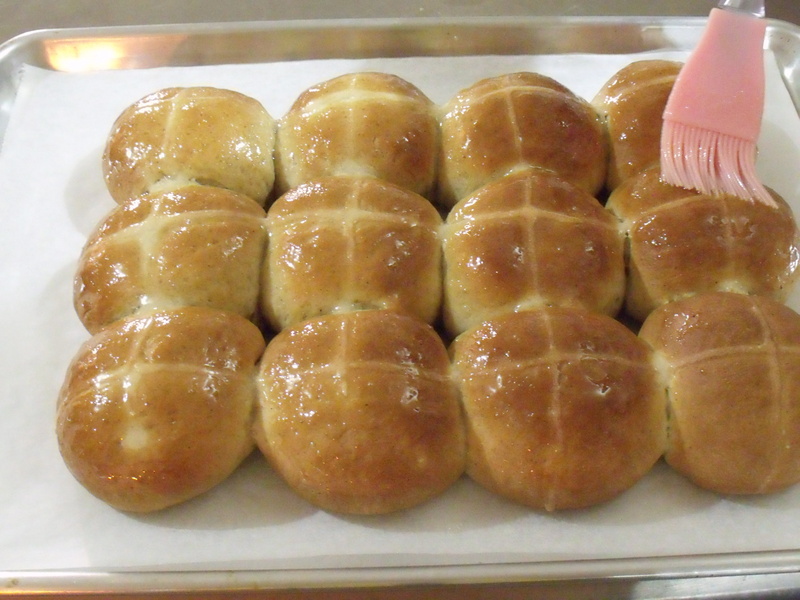 Put it into a Ziploc bag & snip a little off the corner, then pipe it onto the buns. Bake for 20 mins, remove from oven. If you wish you can glaze them to give them a nice shiny look. For the glaze, put the sugar, gelatine & water into a small saucepan & stir over low heat until sugar & gelatine dissolve, brush the buns. 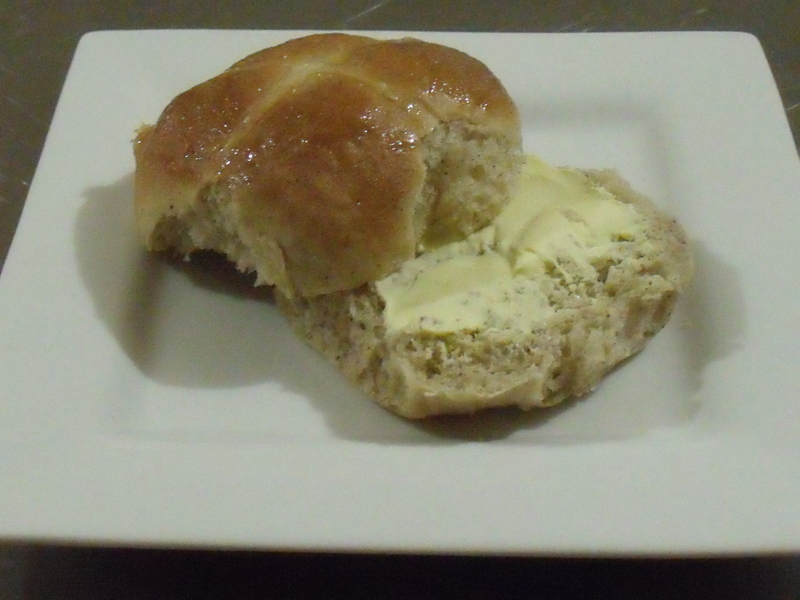 Serve with lashings of butter. 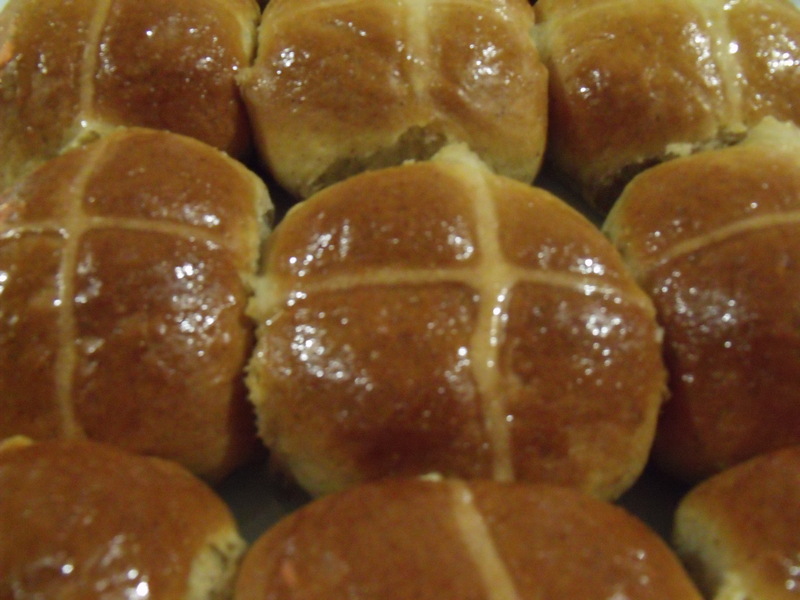 Note: sultanas are usually added to these buns, but I didn’t add them as some of my family don’t like them in there, but if you want them add about ¾ cup in with the flour & spices mixture or add about 1/4 cup of cocoa powder & chocolate chips for chocolate buns.